These two articles reveal how flocks were started by using white sports from cuckoo-colored parents. One might ask where and how such a sport could occur. A relatively recent incident may shed light on this topic. We are some­what comfortable in stating the Voter stock didn’t produce off-color chicks. However, in 1997 white chicks suddenly appeared from a “Voter” mating on my farm. First, let it be stated that the only poultry in the breeding barn were Dominiqucs and Golden Spangled Hamburgs. Early in the 1997 hatching season a tray of newly hatched Voter chicks contained two pure yellow chicks. After that, every few weeks one or two pure yellow chicks would hatch. Through the course of the season I was able to identify which pair produced the off-color chicks. The developing chicks have bright yellow legs and skin. They also have clean red faces with no sign of enamel in the earlobe. What are these chicks? The eggs had been pedigreed and the parent stock was the Voter strain. At first I wondered if there had been a “slip up” involving a White Rock, White Wyandottc or a Chantccler. However as these chicks developed I was forced to toss out that notion and dig deeper. The fact is, the birds are smaller and tighter-feathered than a Dominique. Additionally, nothing about their body type conforms to the known result of the afore­mentioned crosses. Having dismissed the possibility of contamination, I was at a loss. It was during a phone conversation with Mr, Tolley that the connection was made. Robert Henderson routinely sought new blood to improve his Dominiques. During the 1960s Bob became concerned about the size of the Dominique eggs and enlisted the aid of Donald Tolley. 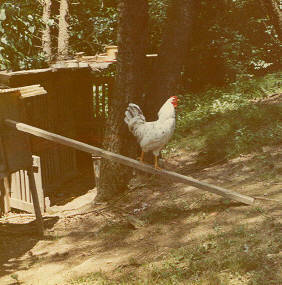 At Bob’s request, Donald sought and procured two white pit-game hens from a cocker in Alabama. Bob discarded one out-of-hand as it had enamel in the car-lobe. From the picture we can deter­mine the pit-game was slightly smaller than a standard Dominique. The pit-game was mated to one of Mr. Henderson’s better Dominique males. The next photograph is a young male produced from that cross. Notice the white body devoid of barring, while the tail is a dove gray. Many of these cross­ed had good Dominique type and were either pure white or white with some ticking. Mr. Henderson’s health began to fail and realizing he could no longer keep poultry he had Mr. Tolley take all of the white offspring from the original crosses. Mr. Tolley commented that though he attempted to remove all the crossed stock, there was no way of knowing if t he standard-colored Dominiques carried the white genes. Prior to Mr, Henderson’s death, Bob gave Roger & Carol Voter a portion of the standard-bred Dominique flock. This along with another male or two was the basis for the Voter strain. The yellow chicks we hatched quickly grew into lovely white chickens. This is not the “dead” white of some breeds, but the lustrous white the Leghorn and Wyandotte fanciers call “silver white.” We are now convinced this is a throw-back to Mr. Henderson’s introduction of the white pit-game hen into his flock 25 years ago. Three pieces of circumstantial evidence support this notion. First, the white chicks are produced by only one pair. The pair were closely related and may even have been brother and sister. During the year, both were mated to other Dominiques with no white chicks produced. In fact, the male sired well over 200 chicks in 1997. When confronted with the question of why the Voters did not experience a similar situation, the answer is surprisingly simple, they did not breed pure Henderson stock. Their flock consisted of Henderson hens with McMurray and Miller males. The Henderson male was used with Miller females. The second piece of evidence has already been given: the lack of foreign traits. The only contamination which could have occurred in the years since 1973 would be (in order): Salmon Favecrolles at the Voters house, White Chanteelcr at Carter Blankenship’s farm, White Rocks at Mike’s house and Golden Spangled Hamburgs at mine. The first and last are highly unlikely due to colors involved and as al­ready mentioned the White Rock and Chantecler cross was dismissed based on size, conformation and feather type. The last piece of circumstantial evidence gathered to-date, is the temperament of the birds themselves. These birds are fiercely territorial and have a firmly established pecking order – more so than the average hen. In the fall of 1998 my entire flock of White Dominiques was culled. A handful of the best specimens were taken to the combined APA/ABA National at Columbus, Ohio where Craig Russell took them for use in recreating Lamonas, White Dorkings and Rhode Island Whites. Other than occasionally looking at the photograph of the White Dominiques little thought was given to them. 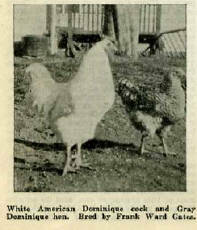 Since the original rooster that sired the chicks was culled there have been no white Dominiques hatched . 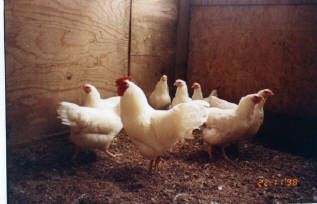 Imagine my surprise when on March 7, 2005 I opened the incubator and found 3 white chicks in one mating and 1 in another. I was struck by the significance of this occurrence. In the last 8 years I have hatched many hundreds of Dominiques. Most years around 200 – 400 chicks are hatched, though the two years we sold chicks there were in excess of 1,000 chicks shipped each year. I feel safe in saying we’ve hatched between 4,000 and 5,000 Dominiques since the last white chick appeared in the flock. How did this happen? This would be a case study in record keeping. The toe-punch pedigree sheets have been maintained since I first started using them. By researching the pedigrees it’s easy to see that one entire family of Dominiques is descended from the cuckoo colored offspring of the “bad” male and his mate. The disconcerting part is that this line has always been closed. Why after 8 years did chicks appear in two matings on the same day? These two matings have one thing in common (besides family lineage) – the same male sired both sets of chicks. This male was a late 2004 hatch and has good size, excellent bluish bars and average or better type. The main flaw is a bad comb. Having been hatched from a large egg and considering the good traits mentioned, it was decided to use him in the breeding pens to offset the dwindling weight in the family. Like his ancestor, this male has been used on other hens without producing white chicks. If I am correct in my analysis of the charts he is producing white offspring only when mated to his dam and sister. After 8 years in hiding I have managed to bring this recessive trait to light again – once again proving that it is extremely difficult to eliminate genetic faults. Among the white offspring there is a noticeable difference between the chicks produced by the different hens. The single chick (sibling mated) is bright yellow with bright orange beak and shanks. The other chicks are yellow with a smokey hue to the tips of the down – especially in the lower back area. Additionally, the legs and beaks of these chicks are not colored as bright. The incubator contains more eggs from these matings, so it is assumed the number of white chicks hatched will increase. The white chicks have been moved to the brooder to monitor their development. Also at the end of the season a careful inspection of the cuckoo colored siblings will be made for any obvious trends. Based on this surprise, after an 8-year absence I believe it is impossible to permanently eliminate the white color in this closed family.